For the most part, “everyday people” empathize with other everyday people. In a world in which a real-time “global conflict tracker” exists, politicians and the news media seem intent on telling their voters and viewers where to focus their full attention. There was a time in Libya before the Arab Spring had sprung, and before North American Treaty Organization’s (NATO) 2011 intervention turned the nation into a hotbed for violent extremism. It seems like it was all so long ago. And indeed, it’s been five years since NATO’s so-called ‘kinetic military action’ in Libya, otherwise known as Operation Unified Protector (OUP), an operation that lasted 222 days, requiring some 8,000 personnel and 26,000 sorties that degraded or destroyed some 6,000 targets. What was the purpose of the 2011 Western-backed military campaign in Libya? Ironically, five years later, the only thing really achieved by Western nations with regard to Libya, is the removal Muammar Gaddafi. The plight of the Libyan people, allegedly the reason for military intervention, appears to be worse than ever. 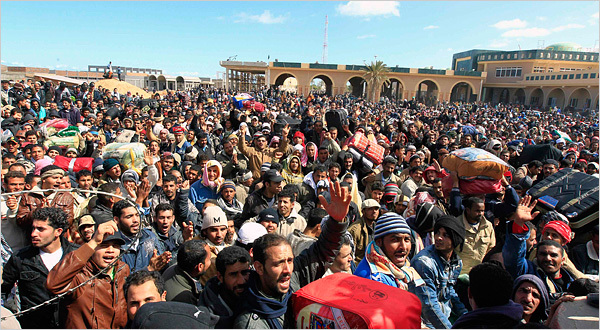 No one is alleging Muammar Gaddafi was a model human being, but when he was in power, there was not, literally, city-sized waves of Libyan refugees, numbering in the hundreds of thousands, fleeing Libya for Tunisia, Egypt, Europe and beyond, as seen below. The Libyan refugees simply did not wake up one morning and flee the country by the hundreds of thousands for the first time in the nation’s history. This all happened after Muammar Gaddafi was rendered useless and ultimately killed, thanks to the Western and NATO military backed campaign in 2011. What about the people? NATO and the President of the United States said that military action was for the oppressed Libyans right? 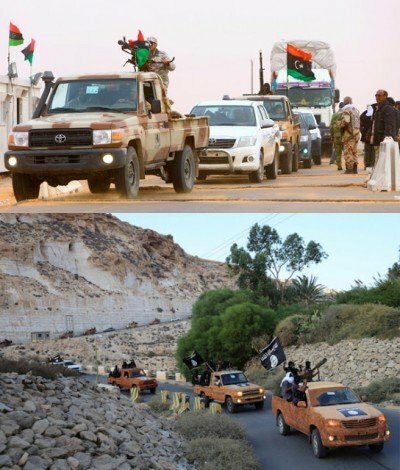 Libya: By Way of Contrast and Detour into Syria. Syria, just as Libya, was part of the Arab Spring. However, Syrian leader, Bashir al Assad, is still in power and there have been increased reports of the Syrian government stabilizing and regaining lost territory. You can read a recent 21WIRE report on Russian and Syrian success against ISIS HERE. The effectiveness of the recent Russian-assisted gains made by the Syrian Army in their fight against ISIS seem to be a source of frustration for the American government. Note the spin and disappointment of the reporter talking about recent gains made by the Syrian government, as well as the lack of chaos and fleeing refugees within the government controlled areas of Syria he’s broadcasting from. You still have to wonder – is unseating Syria’s President Assad the true objective for Western allies and other transnational partners or eradicating ISIS? Are both a means to destabilize the area for an expensive war and rebuilding process with NATO-approved “good neighbors” and compliant business partners? Unlike the American led campaign against ISIS, where the United States’ Department of Defense states there has been an “average daily cost is $11.4 million for 511 days of operations,” against a staggering 21,000 targets through 2015, the Russian assisted Syrian Army has had more success in stabilizing the region against ISIS. Is it really a surprise that ISIS has been building up a presence in Libya, when you consider the fact that Russian air power assisted the Syrian government around the same time? With Gaddafi out of the equation for several years now and the refugee exodus spiraling even further out of control – there’s no doubt that Libya is worse off. Approaching a year from the above report, it is of note that it mentions various jihadist groups being fought against were pledging allegiance to “IS” or Islamic State, commonly referred to as ISIS (Islamic State of Iraq and Syria). The above video demonstrates that tensions in Libya have been on the rise but for the most part, out of the mainstream media’s focus. Furthermore, any future and seemingly inevitable actions within Libya, as well as the requisite and sensationalized news reports that go along with it, should not be taken out of context, nor should they surprise anyone. Since ISIS took the global stage in 2014, the media has been prepping the public that the group would spread abroad, beyond the borders of both Syria and Iraq. It’s as if ISIS is ‘diversifying’ their portfolio of terror. If ISIS ‘terror stocks’ are down in Syria, invest in Libya. 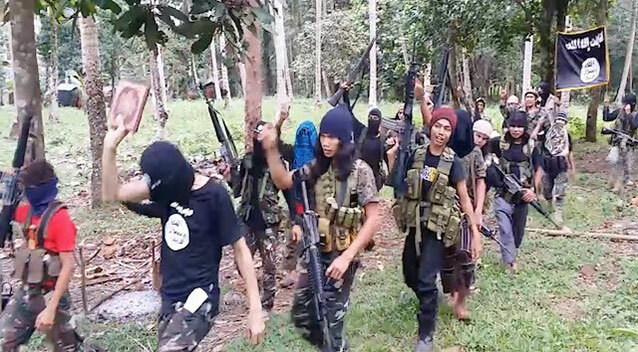 Now the group is alleged to be a global threat stretching from San Bernardino, California, in the United States, to the jungles of the Philippines and beyond. Remaining in Syria though, let’s not forget Obama and NATO’s desire to help the Libyans during their deeply troubling humanitarian crisis back in 2011. In fact, as a result of the Western-backed NATO campaign in 2011 used to oust Gaddafi – the instability has only grown. So any future reports of a sudden humanitarian need, or desire for security, will be presented as if the situation in Libya spontaneously happened. At best, reports will speak of a security vacuum left after the death of Gaddafi. One thing is nearly certain however, and that is that ISIS will likely be the reason to go into Libya, to secure it, with the end objective being to rebuild it and stabilize it on Western terms, not unlike Iraq. If the ISIS “terror threat” to the Western nations, or the “on-again off-again” humanitarian crisis are a little too transparent for you, then the reason to go into Libya could very simply be economic. Staying with the familiar theme of Foreign Interest in The Middle East, the oil and natural resources could be “the reason,” or among the reasons, for outside intervention. Future ISIS attacks within NATO countries and their allies, any potential “boiling over” of the refugee crisis, and the potential stabilization or defeat of ISIS in Syria, are all just some of the reasons—and perhaps all that is needed—for the media push for military intervention with troops on the ground and the highly desired backing of at least most of the public. 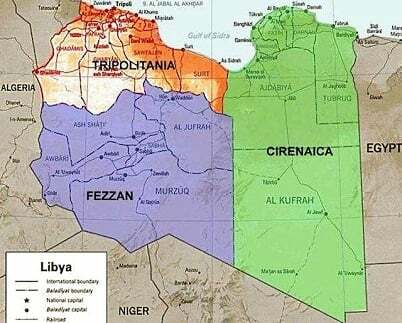 The plan to divide Libya into three was known as the Bevin-Sfora Plan; although it never passed the United Nations assembly (missing by one vote), the possibility of multiple states where Libya once existed, is as possible now as it ever was. Over sixty years ago, Libya was nearly divided up as depicted below, as administered by France and Britain. Today, Libya faces a distinct possibility of going back to the future and something closer to the 1951 Bevin-Sfora Plan. As of this article, Libya is effectively two governments with a huge ungoverned populace between both of them. One is led by Prime Minister Abdullah al-Thinni, centered in Bayda, Libya. Khalifa al-Gwell is the other Prime Minister, based Tripoli, who runs the other Libyan Government. Both men and their respective Libyan Governments are fighting for control of —surprise — the 800,000 barrels of daily oil production. The two governments are also brokering and positioning for a potential “Unity Government,” as brokered by the United Nations. Meanwhile, the mainstream media as reposted here by Yahoo!, points out that the ISIS numbers are down in Syria but have increased to around 5000 in Libya. Any government in Libya, or “both” governments in Libya, are likely to want outside assistance in their fight for control and against ISIS. In fact, Pentagon Spokesperson Peter Cook, states there are Special Forces within Libya assessing the situation in what appears to be a “fact finding” exercise prior to any commitments. Many oil and resource rich nations of the region have been both friends and devils. Whether it is a CEO, a mafia boss, or a politician, it’s not personal — it’s just business. Like with business, sometimes there are agreements between nations. Other times there are under-handed public relations campaigns, or even literal hostile takeovers that play out over days or even decades. If you “felt like you’ve seen this game before” it is because you have. It is becoming clearer that Libya, once a sovereign and relatively wealthy nation, is becoming a mere playground for a massive geopolitical game and large economic interests and ambitions. Sadly, Libyans themselves are the very enablers behind the division of their own country, with Arab and Western powers scheming to ensure a larger share of Libya’s economic wealth and strategic value. The ‘economic wealth and strategic value’ of Libya, stated above, were not so easy to acquire with Libyan leader Gaddafi still in power. In the end, Gaddafi appears to have been a mere detour for the West, no matter how many governments and sub-divisions of people and land it takes to get there.